The makers of Babumoshai Bandookbaaz have released a brand new poster of the film, and Nawaz’s look is intriguing as hell. In the poster, Nawaz is sitting on a bike, and eating a laddoo. He sports a gun in his back pocket and the visuals depict that there is a man lying on the ground, which implies that Nawaz has something to do with the man being unconscious. With films like Gangs of Wasseypur, Raman Raghav 2.0 and Badlapur, Nawazuddin Siddiqui has proved time and again that there can only be one Nawaz in Bollywood and no one can replace him! Be it his charm or the way he delivers his dialogues, Nawazuddin has taken every performance of his to all new heights and has set a new standard in terms of acting. 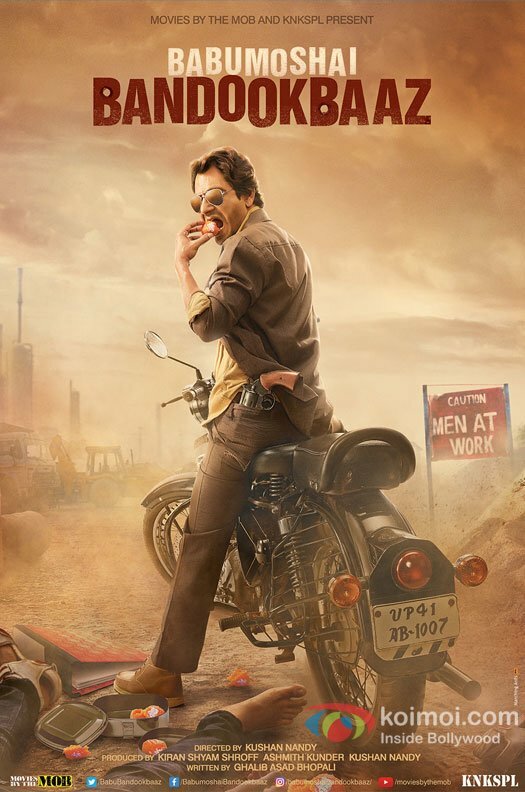 Babumoshai Bandookbaaz’s New Poster Shows Nawazuddin Siddiqui In A Badmaash Avatar! He plays both positive and negative characters with such ease and makes sure his audience falls in love with him every time. With critics going gaga over his performance in ‘MOM’, we surely can’t wait to watch Babu create magic on screen! Watch out for the trailer of Babumoshai Bandookbaaz coming out tomorrow, 11th July. “It’s very realistic, very desi and it has all the ‘besharmi’ (shamelessness) from which we try to save ourselves. There are hypocrites all around who say we don’t want to see these things, but when alone, they see it all… Only when they’re out in the society, they become ‘shareef’,” he added. “This film breaks it all, and I would say, ‘Bahut hi besharam film hai yeh (This is a very shameless film’),” Nawaz concluded. Produced by Kiran Shyam Shroff and Ashmith Kunder, directed by Kushan Nandy and written by Ghalib Asad Bhopali, Babumoshai Bandookbaaz is scheduled to release on 25th August, 2017. The post Nawazuddin Siddiqui Has His Swag Mode On In This Babumoshai Bandookbaaz’s New Poster appeared first on Koimoi. Gangster Look Of Nawazuddin Siddiqui From Munna Michael Is Out! Nawazuddin Siddiqui’s Babumoshai Bandookbaaz Already A Winner At The Box Office! Nawazuddin Siddiqui To Romance Kriti Sanon In Vishal Bhardwaj’s Next? "The Fault in Our Stars" Movie Poster Just Released! Total Siyapaa: New Poster Out! First Look Poster Of Heropanti : Tiger Shroff Makes A Cool Entry!